Grand Floridian Beach Resort: In 1997, the hotel was renamed to Grand Floridian Resort & Spa. Vacation Club Resort: Opened on October 1, 1991 and became Disney's Old Key West Resort in January of 1996. Americana's Dutch Resort: Located near the old Preview Center, this hotel later became the Grosvenor Resort, then the Regal Sun Resort in 2007 and then the Wyndham Lake Buena Vista in 2010. Courtyard by Marriott: Originally the location of Howard Johnson's. Opened January 20, 1995 and closed December 30, 2003 to become a Holiday Inn. Doubletree Guest Suite Resort: Now known as Doubletree Suites by Hilton after the company acquired Doubletree's previous owner, Promus Hotel Corporation in 1999. Grosvenor Resort: Formerly the Americana's Dutch Resort. It later became the Regal Sun Resort in 2007 and then the Wyndham Lake Buena Vista in 2010. Guest Quarters Suite Hotel: Formerly Pickett Suite Resort Hotel. It became a Doubletree on February 23, 1995. Howard Johnson's Resort Hotel: This hotel was next to the Royal Plaza. It was replaced by Courtyard by Marriott on January 20, 1995. It closed December 30, 2003 to become a Holiday Inn. Pickett Suite Resort Hotel: Opened March 15, 1987 and later became Guest Quarters Suite Resort. Regal Sun Resort: New name for the Grosvenor Resort (formerly Americana's Dutch Resort) in 2007. Later became the Wyndham Lake Buena Vista (not the same hotel as the Wyndham Palace Resort and Spa) on November 10, 2010. Royal Plaza Hotel: Opened in January of 1973 and once home to the Giraffe nightspot that was popular with Cast Members. It closed in 2013 and became a B Resort in 2014. It was located next to the Howard Johnson's. TraveLodge: It was located next to the former Preview Center and across from the Royal Plaza. It was also known as TraveLodge Tower. The building used epoxy instead of mortar in the masonry which allowed it to be 16 stories tall instead of the 12 dictated by traditional building codes. At one point it was the tallest structure of its type of construction in the country. From 1984-1989 it became the Viscount. After that it became the Best Western Lake Buena Vista Hotel. Wyndham Palace Resort and Spa: This hotel was originally opened as the Buena Vista Palace on March 3, 1983. It later became the Wyndham Palace Resort and Spa on November 1, 1998 but went back to the Buena Vista Palace name in August of 2005. Ariel's: A seafood restaurant the Beach Club Resort from November 19, 1990 to May 3, 1997. Atlantic Wear & Wardrobe Emporium: A gift shop at the Beach Club Resort. It closed on January 5, 2005 and was replaced by the Beach Club Marketplace on March 24, 2005. Bonfamille's Cafe: A full service restaurant at Port Orleans Resort from May 17, 1991 to August 5, 2000. Flagler's: An Italian restaurant that opened on the second floor of the Grand Floridian on June 28, 1988. It closed on July 6, 1997 and was replaced by Citricos. Kozzina by Cat Cora: Kozzina is Greek for "kitchen". This Mediterranean restaurant replaced Spoodles and was open from August 15, 2009 to September 30, 2014. It was replaced by Trattoria al Forno. Seashore Sweets: Candy store at the BoardWalk Resort from July 1, 1996 to January 31, 2016. 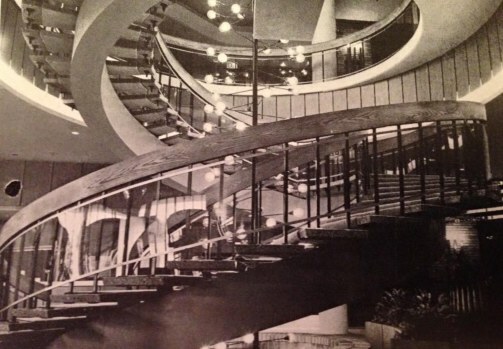 It was replaced by the AbracadaBar Lounge. Spoodles: Restaurant at the BoardWalk Resort from July 1, 1996 to August 1, 2009. It later became Kouzzina by Cat Cora. Yacht Club Gallery: Located at the Yacht Club Resort, this restaurant became known as the Captain's Grille on January 1, 2008. 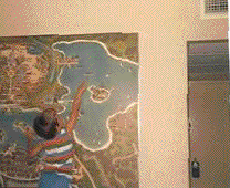 Remember when resort rooms used to have giant maps of Walt Disney World in them? Thanks to Chris Thomas for sending in this cool picture. Unfortunately, I can't improve the quality of the picture or make it larger. Lynne O'Neil writes about a fantastic plan that she remembers called the World Adventure Plan: "One thing that many people never knew about is that Walt Disney World Resorts reservations in the mid 1980's used to have an all inclusive vacation package plan. It was called the "World Adventure Plan". You could only get this plan through Walt Disney World reservations and you had to ask for it as they never offered it. In other words, you had to say "by the way, do you offer a package plan?". No other travel agent offered this plan, none of them even heard of it. It was strictly through Walt Disney World. The plan was fantastic and the sky was literally the limit. It was offered for the Polynesian, the Contemporary, The Disney Inn (at the time), and then the Grand Floridian. The plan offered your hotel room, all three meals per day at ANY Walt Disney World sit down restaurant in the hotels and theme parks (including appetizer, main dish, dessert, non alcoholic drink), ALL dinner shows (Polynesian Luau and Broadway at the Top show at the Contemporary), all boats and recreation (boating, fishing, horseback riding) without a time limit, as many times you wanted during your stay, and all theme park admissions. It was the best package. The only things you needed to pay for were your alcoholic beverages, your own souvenirs and your own way of getting to Walt Dated World. All the tips were included. I'll never forget it. Since there were no limitations, you could go over to the Empress Lilly and order away off the menu. We got Maine lobster for $60, an appetizer and a dessert. The bill for 3 of us was well over $300 which we didn't have to pay. It was already paid up front in advance, but trust me, you got so much more for what you paid for in the all inclusive package plan. I still have the card, the size of a credit card." In 1972, there may have only been only four resorts but there was still a lot to do.